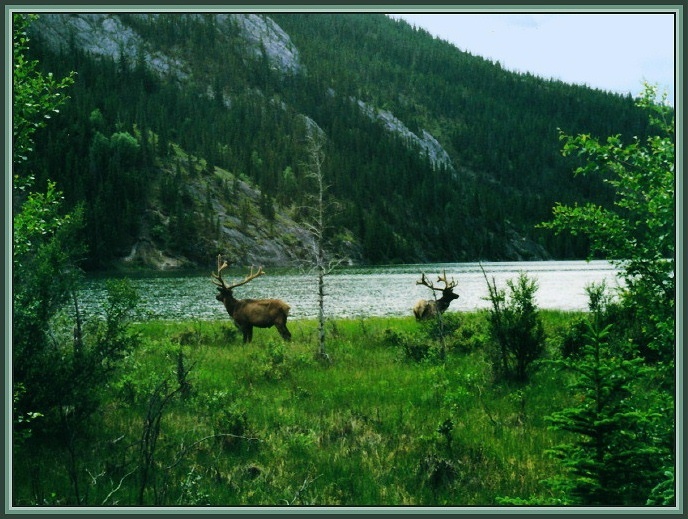 On holidays some years back, hiking in Banff I came across these Elk. Not being brave like some people here on trek nature I kept my distance and shot a couple pictures. I am hoping to get back to the mountains soon, with enough time to do hikes into the bush but at this point with work I have to show old pics with my old camera. Scanned from paper, color adjust, cropped slightly, and resized for TN. Those are some magnificent elk, Christian. A nice capture in the wild showing their natural habitat. I like the original shot, but it's showing its age. It still looks a bit green to me, so I think you could correct the color a bit better. I think the shot is worth the effort. This very nice, especially since it was scanned. It reminds me of a lost world. If I can figure out how to post it, I did a workshop. I cropped it, changed the gamma and brightness and sharpened just a tad. But over all, I do like this photo. I would love to see the orginal from the negative. You might be able to get a clearer shot or a closer image of the deer. Very scenic landscape, nicely captured. Should be nice to view the elks a bit closer, enable us to see details of this beautiful animal. YESSS! I knew you had it in you! Finally, you started to become Canadian... :) This is one amazing shot Christan, you probably hiked a lot more often and further before you had the children. But its there; you shouldve started with this! A lovely true nature scenery! Situation is nicely framed, the shimmering water adds to the beauty! F�licitations pour cete prise nature. A beautifull scene very nice composition nice strong colours would make a nice painting rgds Necip. C'est Une merveilleuse photo que ce Joli paysage avec en prime deux beaux elks m�les.Tr�s belle composition, les couleurs et le cadrage et les d�tails sont tous tr�s bons. Tak zwany kiczowaty widoczek, ale bardzo dobrze zrobiony. Fajna fotka. brilliant colours, strong light reflected from the surface of water and an excellent, well balanced composition make this presentation of landscape and wildlife outstanding. Both elks are perfectly visible in excellent pose against the water. Oh wow, very nice image. Makes me wish I was there. thats just awesome. The green may be a bit over saturated but still looks great. nice shot. you could crap more the bottom.